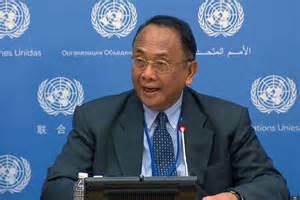 On Monday, Makarim Wibisono, PhD, United Nation special rapporteur on human rights in occupied Palestinian territories quit his post. He blamed the Zionist regime of interfering in his work and running a character assassination campaign against him. “Israel has blocked me from fulfilling my UN mandate to human rights violations in the occupied West Bank and Gaza Strip,” Wibisono said. “Unfortunately, my efforts to help improve the lives of Palestinian victims of violations under the Israeli occupation have been frustrated every step of the way,” Wibisono added. “With no reply from Israel to my latest request, in October 2015, to have access by the end of 2015, it is with deep regret that I accept the premise upon which I took up the mandate, which is to have direct access to the victims in the Occupied Palestinian Territory, will not be fulfilled,” Wibisono said in a statement. The Zionist entity has always accused the UNHRC of anti-Semitism for creating the post. Netanyahu has claimed the Israel’s human rights are not as abusive as Iran, Turkey or Syria – a lie most of American law-makers a politicians don’t have the guts to challenge. In 2014, UNHRC chose Wibisono, former Indonesian ambassador at United Nation, to succeed the outgoing special rapporteur, American Jewish academic Richard Falk. Wibisono’s appointment was slammed by several Israeli Hasbara organs as result of Wibisono being a Muslim. David Horowitz’s FrontPage magazine even wrongly projected Wibisono as past head of Jeddah-based Islamic Organization of Cooperation (IOC). Dr. Wibisono, the sixth person to hold position was forced by Israeli boycott of UNHRC to carry out most of his investigations from neighboring Amman, Jordan. Commenting on Wibisono’s resignation, American Jewish writer, author and radio talk-show host, Stephen Lendman said: Israel’s ongoing reign of terror against millions of Palestinians reveals a regime dedicated to barbarism, tolerating no criticism of its ruthlessness – institutionalized racism, fascism on steroids for Palestinians, treating them the way Hitler persecuted Jews (here). Professor Richard Falk who stood-up to Israel, ADL, UN Watch, HRW, Samantha Power, US ambassador at UN vicious defamation campaign for six years (here) has claimed that based on his own experience, he had warned Dr. Wibisono that he would be wasting his time because as usual Israeli government would never cooperate with him. It is worth recalling that when Wibisono was selected as my successor, several more qualified candidates were passed over. Although the selection guidelines stress expert knowledge of the subject matter of the mandate, Wibisono apparently gained the upper hand along with the acquiescence of Israel and the United States precisely because of his lack of any relevant background. I can only hope that now the UN Human Rights Council (HRC) will redeem its mistake by reviving the candidacies of Professor Christine Chinkin and Phyllis Bennis, both of whom possess the credentials, motivation and strength of character to become an effective special rapporteur. The Palestinians deserve nothing less, Falk said. Read the rest here.